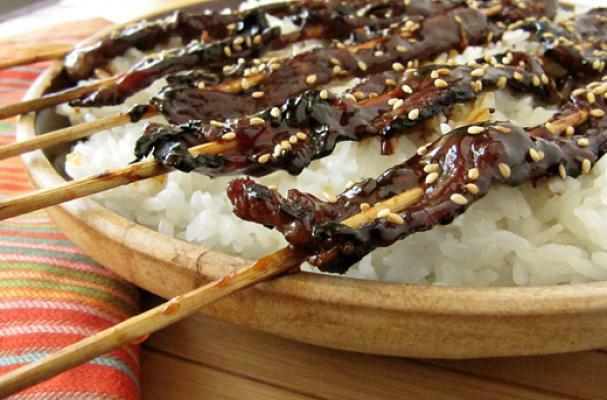 Meat on a stick is a simple pleasure and this recipe for beef yakatori is exactly that. Tender pieces of flap steak are marinated in a homemade teriyaki sauce before being skewered and grilled. The final touch is a sprinkling of toasted sesame seeds. Beef yakatori is best served with a side of white rice to soak up that delicious sauce. Place the mirin in a medium pot and boil over high heat. Reduce to medium low and add remaining ingredients. lace half of sauce in a Ziploc bag or container and refrigerate until cool. Take thinly sliced beef flap steak and cut into 1½-2 inch strips for skewering. Submerge in cooled marinade and refrigerate for at least another hour. Take bamboo or wooden skewers and soak in cool water for 30 minutes. In a small bowl, whisk the cornstarch with water. Bring the remaining sauce to a boil and thicken with the cornstarch mixture, constantly stirring. Let the sauce cook for 5 more minutes, tasting to make sure the cornstarch has fully dissolved. Once ready, pour into small bowl and set aside. Preheat grill to high (roughly 400°). Just before grilling, take marinated beef and skewer so that the meat can lie flat. Place canola oil in a small bowl. Using a paper towel or cloth, dip in canola oil and rub over hot grates to prevent sticking. Lay beef skewers over heat and stay nearby to monitor. Once bottom is a little charred, brush the tops with canola oil, and flip. Brush again with thickened teriyaki sauce. Once the bottoms are slightly charred again, be careful not to overcook, flip and brush with thickened teriyaki sauce, so both sides are sauced. Remove and garnish with toasted sesame seeds.